Did you know that over 80% of people will experience gum disease to some degree in their lifetime? For many people, this statistic is alarming, especially considering the fact that severe gum disease is the leading cause of adult tooth loss. In many cases, however, gum disease doesn’t have to be that serious. In fact, in its earliest stage (known as gingivitis), you have a small window of reversing the infection in your gums before more serious gum disease develops. Gingivitis isn’t different from gum disease, but is rather one of many stages of it. As the first stage, gingivitis describes an infection that develops in your gums as a result of excessive oral bacteria gathering along your gums. These microbes produce harmful toxins that irritate your gums, causing them to separate from your teeth and form pockets where more bacteria can accumulate. If you exhibit signs of gingivitis, then your dentist can suggest deep cleaning in addition to regular dental cleaning. Deep cleaning, or periodontal cleaning, is the process of carefully cleaning away harmful oral bacteria from the surfaces of your teeth roots. 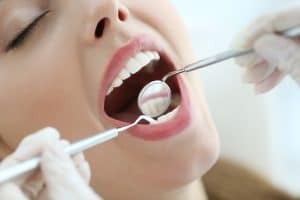 Unlike a regular dental cleaning, deep cleaning requires your dentist to clean underneath your gums, which can be a longer and more complex procedure. The point of deep cleaning is to give your gums time to heal from the bacterial infection and to stop it from growing worse. However, if it’s too late to reverse gingivitis, then it may just be the beginning of a more involved periodontal health routine. If you visit your dentist as soon as you notice the signs of gingivitis, then you may have a good chance of reversing it before you develop a more serious form of gum disease. To learn more, schedule a consultation with Dr. Burds by calling Gateway Dental Group in downtown Des Moines, IA, at (515) 244-9565.